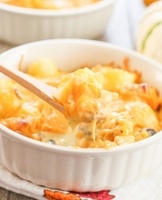 This warm and hearty casserole is creamy, cheesy and easy to put together. It’s the perfect weeknight meal. I do not like that it gets dark so early now. During the summer, we would regularly eat dinner between 7-8 PM. But now that it gets dark so early, I’m already hungry before 6 PM. As a result, I don’t have much patience for elaborate dinner meals. Which is why casseroles are so nice. You throw everything together and stick it in the oven, and then it’s ready to go. 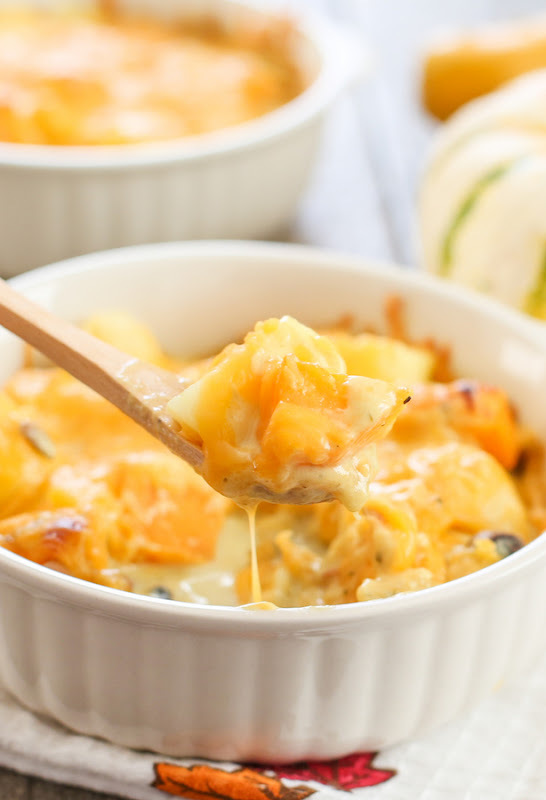 The casserole is full of potatoes, butternut squash, beans, chicken, and anything else your heart desires. Rather than a cream soup base, I decided to use a curry sauce, which really amps up the heat and flavor of the dish. 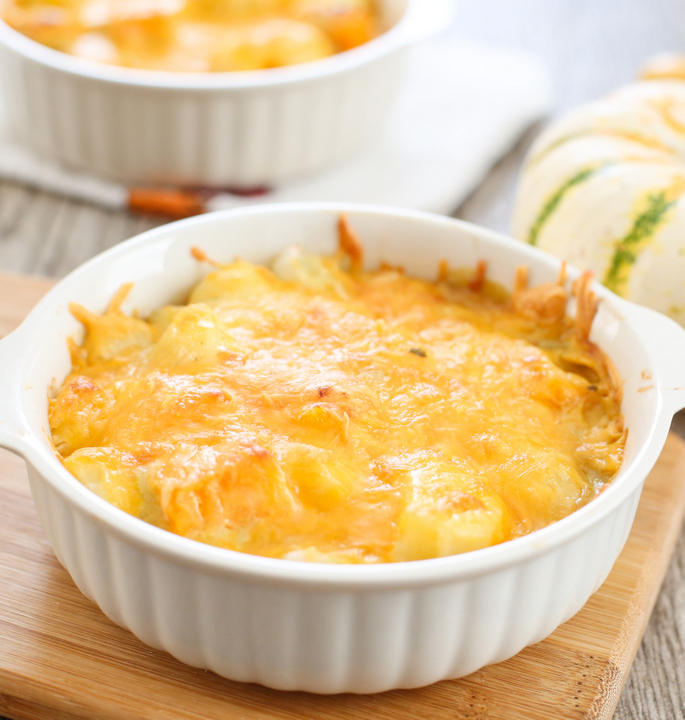 And of course, what’s a casserole without a layer of melted gooey cheese? As you may recall, I’ve worked with Melissa’s Produce, a specialty produce distributor based in Los Angeles before. I love seeing what they have to offer and recently they sent San Diego Food Bloggers some seasonal product to play with. 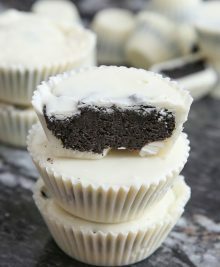 The challenge was to use at least 3-4 of the ingredients provided. I used five (not pictured is the butternut squash). 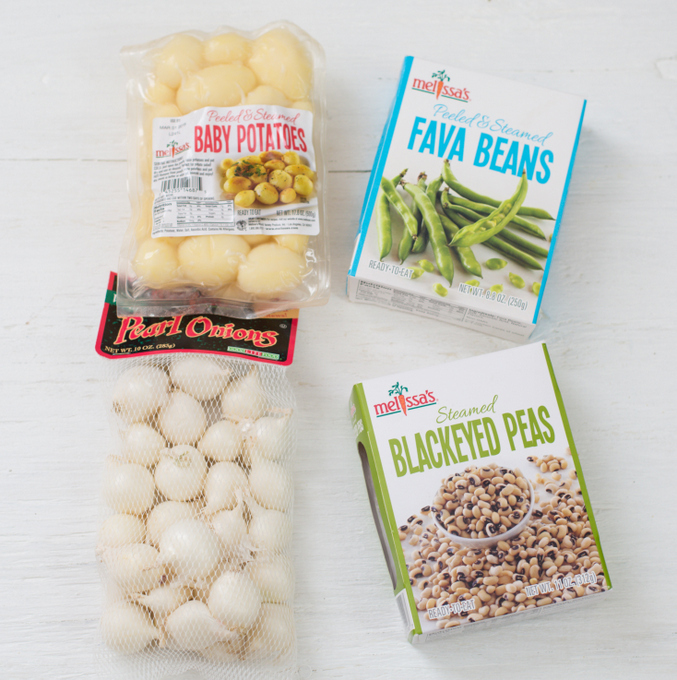 I honed in on the ready steamed potatoes, fava beans and black eyed peas. It makes cooking so much easier when they are ready made. Of course, if you don’t have these products, you can always prepare and cook a big batch of ingredients ahead of time. 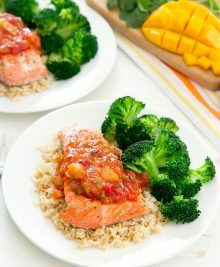 Then right before your meal, you add everything, heat it up, and dinner is served! I really wanted to use the butternut squash, to add some color and a touch of sweetness to the dish. So I roasted my butternut squash ahead of time and chopped it up so it was ready when I made this casserole. Be sure to check out what my fellow San Diego food bloggers came up with at the end of this post, after the recipe. And special thanks to Melissa’s Produce for providing us with some delicious product for the challenge. Disclaimer: As indicated above, Melissa’s Produce provided me with some product for this challenge. I was not further compensated for this post, and my opinions are my own. 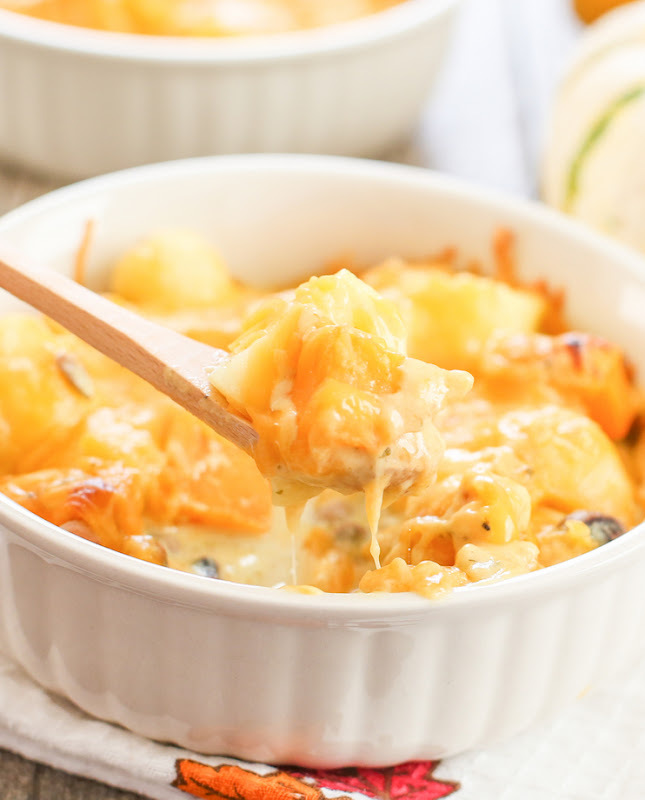 This warm and hearty casserole is creamy, cheesy and easy to put together. It's the perfect weeknight meal. Preheat oven to 350°F. Prepare two individual round casserole dishes, about 5 inches in diameter. 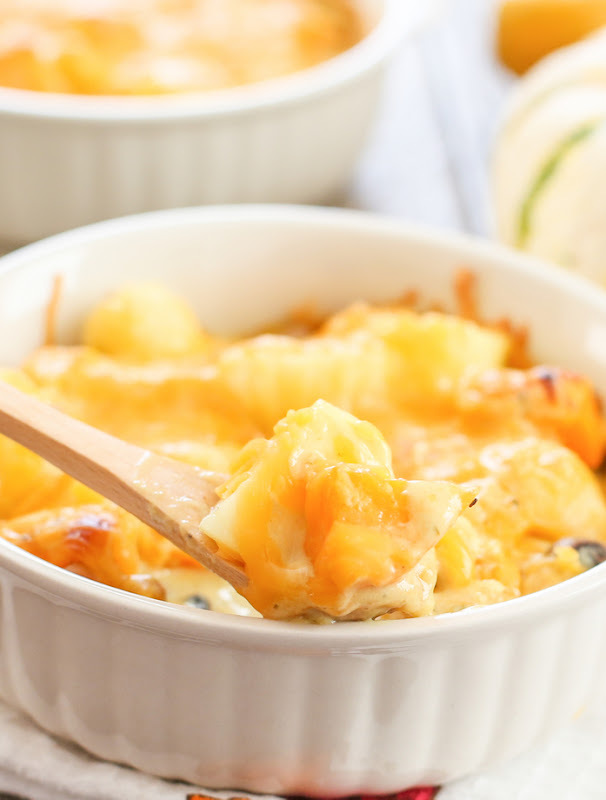 Evenly divide all the ingredients, except the cheese, between the two serving dishes. Sprinkle 1/2 cup of cheese on top of each one. Bake dishes for about 15-20 minutes or until everything is thoroughly heated and cheese is melted. Turn oven to low broil for about 2-3 minutes until the cheese bubbles and begins to brown. Serve immediately. I used Campbell's skillet curry sauce. I got the goodie box as well, and I was kind of stumped by the steamed baby potatoes! Thanks for sharing because I will make this recipe!! Just look at that cheese!!! Pure comfort… love what you’ve done with the ingredients!